I live on the East Coast and love to write about sports such as hockey and basketball. 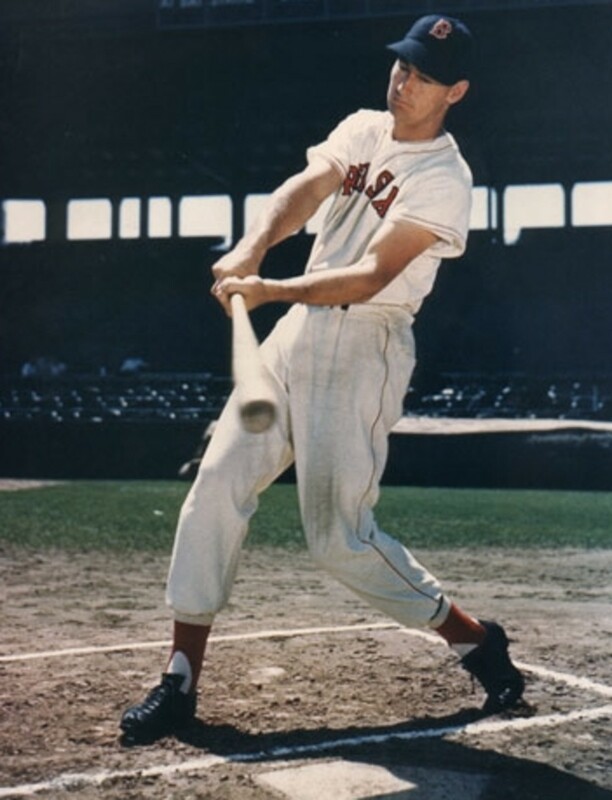 Ted Williams was the last player to bat .400 in a season and is considered by many to be the best hitter in baseball history. He had an epic major league career that touched four different decades from 1939 to 1960 and for his accomplishments he was elected to the Baseball Hall of Fame in 1966. Many believe he had an even more incredible life that included military service in two wars, fishing adventures around the globe, and significant charitable work. 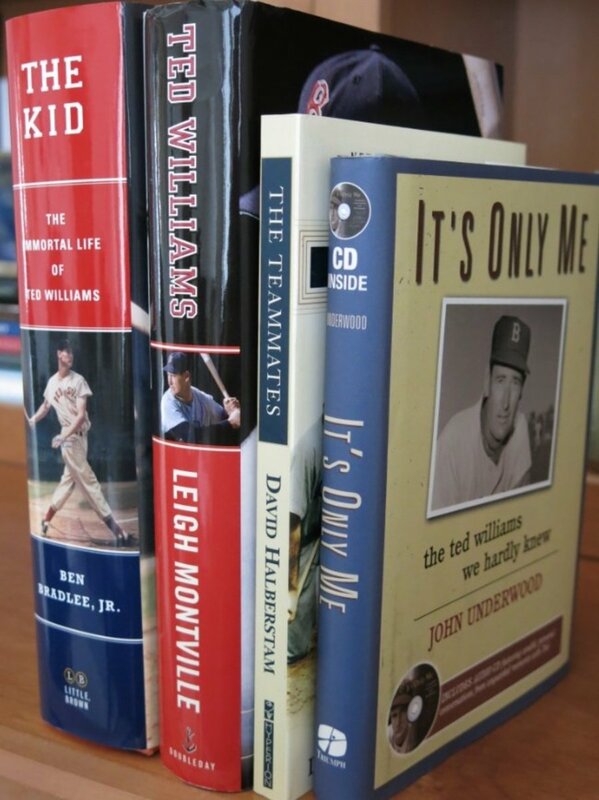 Numerous books have been written about the Splendid Splinter and two of the best are Ted Williams: The Biography of an American Hero by Leigh Montville and The Kid: The Immortal Life of Ted Williams by Ben Bradlee Jr. Both books paint fascinating and sometimes unpleasant pictures of Williams the player and man. Montville’s book is the more colorful of the two, but Bradlee’s is enjoyable for the shear amount of exhaustive detail contained in its 774 pages. Most fans know of Ted’s baseball heroics, military activities, and fishing conquests. In this article I wanted to forgo the more familiar events of his life like the last at bat home run and the jet crash in Korea and instead highlight ten of the more obscure, but often equally interesting exploits that are recounted in the pages of these two great books. As mentioned in the introduction, Ted was the last player to hit .400 in a season. He accomplished this magical feat in 1941 at the tender age of 22 when overcame tremendous pressure on the last day of the season to go 6 for 8 and raise his average from .3995 to the final .406 mark, which is now one of the landmark numbers in baseball history. Not many are aware, however, that Williams nearly accomplished this staggering feat 16 years later at the ancient age of 38 and that it came about almost accidentally. 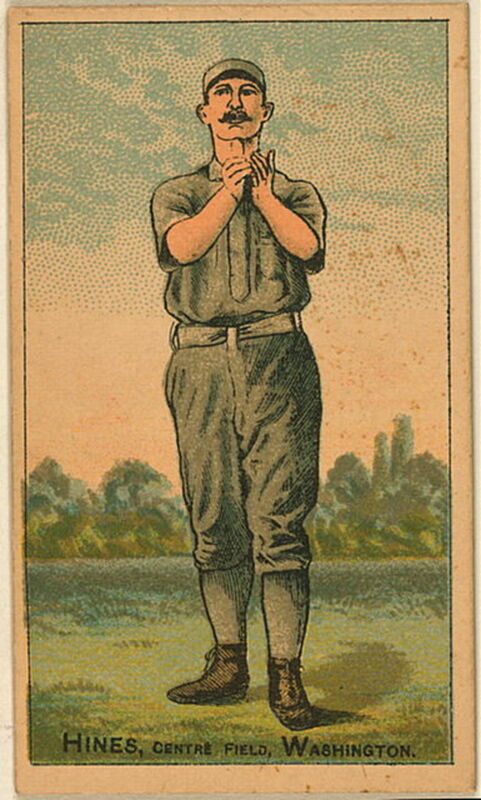 Williams was a notorious pull hitter, which means he almost exclusively hit the ball to right field. After his success in the early 1940’s, the league finally adjusted to his hitting style later in the decade with something called the Boudreou shift, a strategy which called for teams to pack as many players as possible on the right side of the field to neutralize Williams’ strength as a pull hitter. Ted stubbornly refused to hit to left field and his numbers suffered for years as he battled against the shift. In the 1957 season, however, Williams almost by accident figured out a way to beat the shift. He started experimenting with a heavier bat, 34 ½ ounces compared to his normal 32 ½ ounce model, and the extra weight caused him to be a little late on pitches. He started hitting rockets to left and center field, places that he rarely hit to before, and as a result he was able to neutralize the shift and got off to the best start of his career batting .474 with 9 home runs through the first two weeks of the season. Opposing teams were now forced to play Williams more straight up. He even went back to his lighter bat later in the year to take full advantage of the situation. Some of his highlights from the season include blasting three home runs in a game on two separate occasions and reaching base 16 consecutive plate appearances in September. In spite of all the success, Williams still fell 5 hits short of the elusive .400 mark. 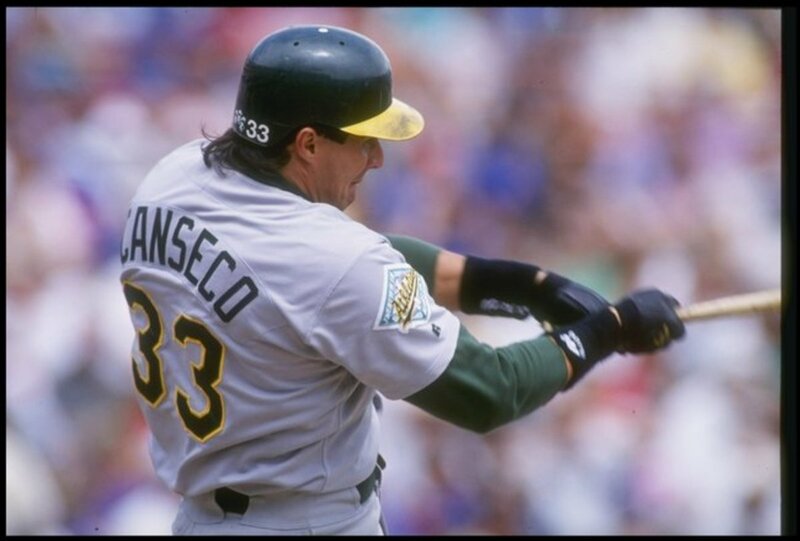 At his advanced age he could no longer run very well and the infield leg hits that a younger player could easily accumulate just didn’t happen for him. It was still an incredible season, one of those wonderful occasions when everything came together one last time for a veteran player, and he finished the year batting an astounding .388. Since then, only two players have come closer to batting .400, George Brett when he hit .390 in 1980 and Tony Gwynn who batted .394 in 1994. Williams regarded the 1957 season as his greatest baseball achievement. The 38 year old Williams fell just 5 hits short of the elusive .400 mark in 1957. Most baseball fans know that Ted's last season was 1960 when he famously hit a home run in the last at bat of his legendary career. However, the Williams' biographies reveal that he had briefly and mysteriously retired once before after the 1954 season. In April of that year Ted revealed in The Saturday Evening Post that he was an old man by baseball standards and that 1954 would be his last season. The cryptic announcement struck most people as odd because Ted could still hit and he still liked baseball. 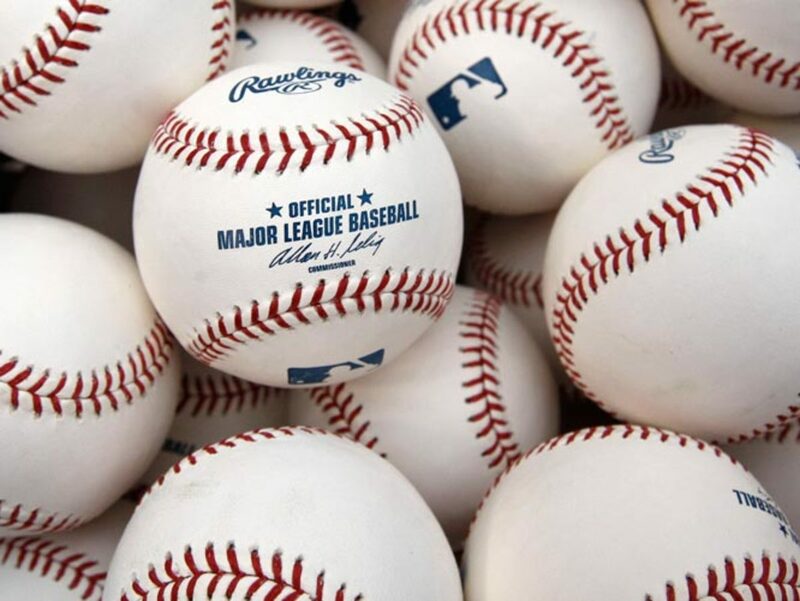 A few writers guessed it was somehow related to his divorce from his first wife Doris Soule because if he wasn't playing baseball then his income would be less and the divorce settlement would be less. Ted finished the 1954 season at .345 with 29 home runs and 89 RBI, numbers not typically associated with a player past his prime. Even though no retirement festivities were held in his honor at the end of the season, Williams still told everyone he was done and proceeded to go fishing. Spring training for the 1955 season rolled around and Ted was still fishing. The connection to the divorce become more obvious as lawyers for the two parties were reported to be holding conferences. The baseball season started without Ted and April ended without sight of him in a baseball uniform. A divorce settlement was finally reached on May 9th and Ted, to no one's surprise, finally put down his fishing rod and started training to get into baseball shape. He finally stepped on the field in the Red Sox's 42nd game of the season on May 28th. He played 98 games in 1955 and hit .356 with 28 home runs and 83 RBI. Again, not too shabby for someone too old to play baseball. Could you imagine a player pulling this type of stunt today? The George H. W. Bush campaign was reeling after a third place finish in the 1988 Iowa caucus. If Bush lost the New Hampshire primary his chances at the Republican nomination would be over. Enter Ted. He was recruited by former New Hampshire governor John Sununu, who was now running the Bush campaign, to stump for the vice president. Williams traveled with Bush through New Hampshire and rabid Red Sox fans came out by the thousands to see him. Vice president Bush was an afterthought at many of the stops as he watched Ted sign one autograph after another. Bush won the primary and the momentum he gained with the victory carried him to the Republican nomination and eventual victory in the presidential election. An interesting side note to this episode is that Bush and Williams briefly crossed paths 45 years earlier when both were cadets at the Navy Pre-Flight School in Chapel Hill, North Carolina in 1943. 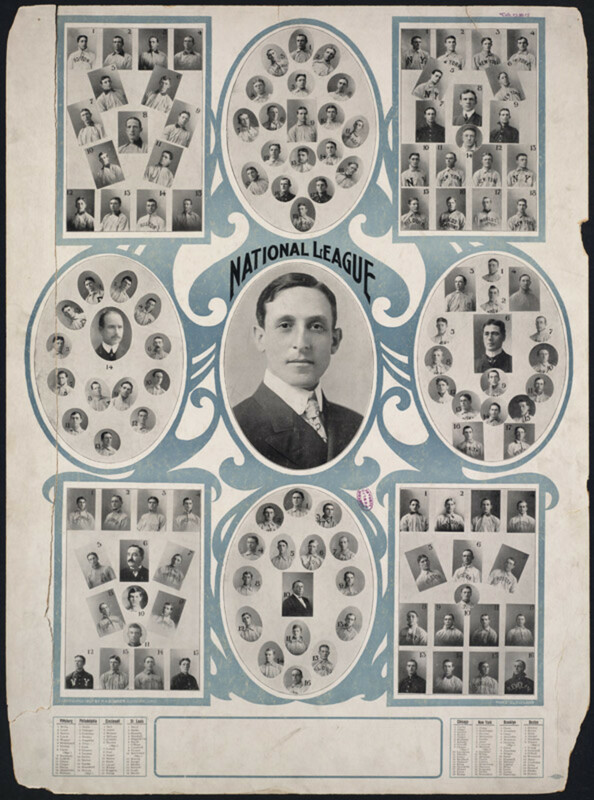 Yes, Ted was also a manager in the major leagues. After being away from baseball for almost a decade he was wooed back by Washington Senators owner Bob Short to manage his moribund team which had finished last in the American League East in 1968. The first year of managing was magical for Williams as his energy, enthusiasm, and charisma lifted the Senators to a 86-76 record and a fourth place finish with basically the same players the team had the year before. For his effort Ted was voted Manger of the Year for 1969. Sadly the magic didn't last as Ted lost interest and irreverent players such as Denny McLain began to rebel. The team finished 1970 back in last place with a 63-96 record. The team moved to Texas and surprisingly Ted managed two more years before he turned in his jersey and returned to fishing. One highlight from his last year as manager occurred on August 25, 1972 when Ted participated in a hitting contest at Fenway Park. 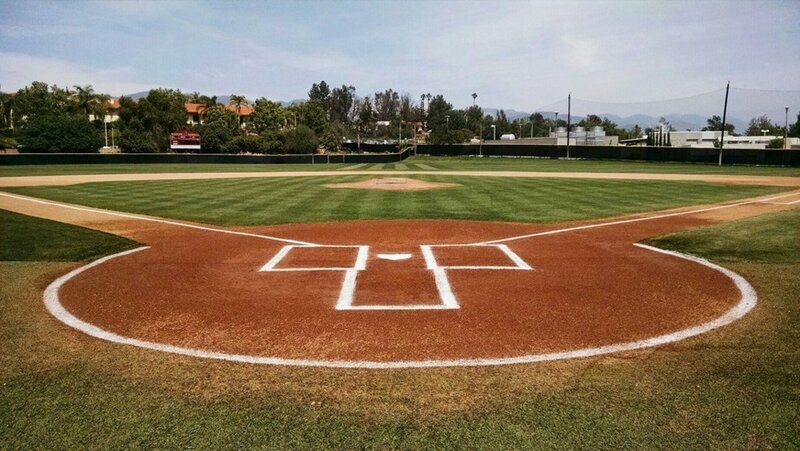 Even though he hadn't swung a bat in many years the 53 year old Williams stepped up to the plate and hit ropes to all fields. Many Rangers players said it was the most amazing thing they had witnessed on a ball field. 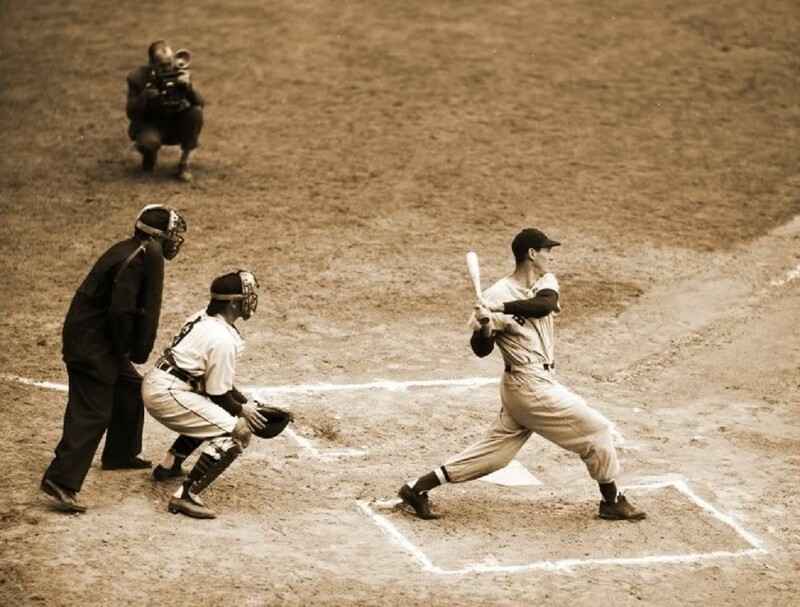 One of the all time great baseball "what-if" scenarios involved Williams and Yankee great Joe DiMaggio. 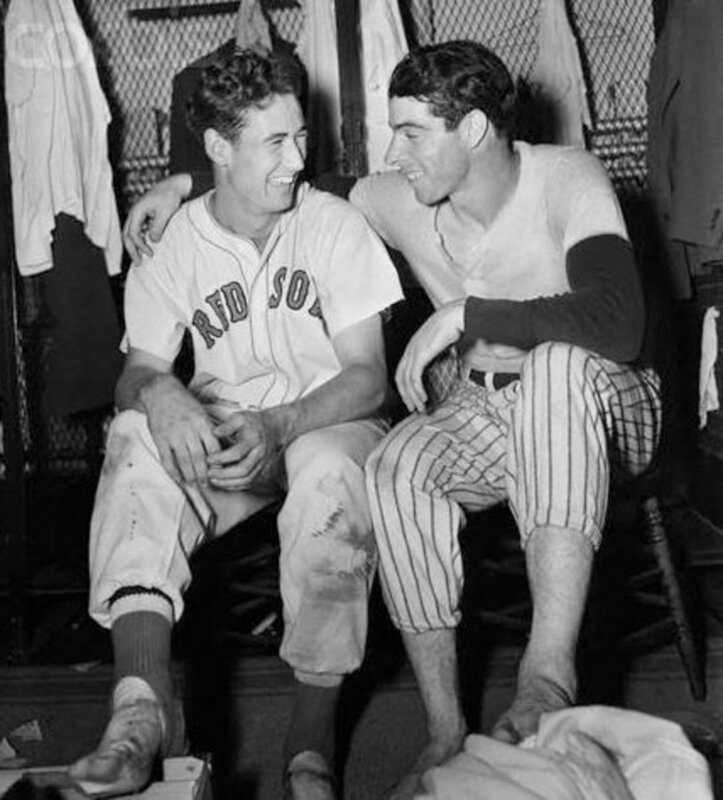 Both played home games on fields that diminished their respective talents due to ballpark configurations: the cavernous left-center field in Yankee stadium for the right handed DiMaggio and the deep right field in Fenway for the pull hitting Williams. Baseball fans were always wondering what kind of numbers the two could put up if they swapped teams. 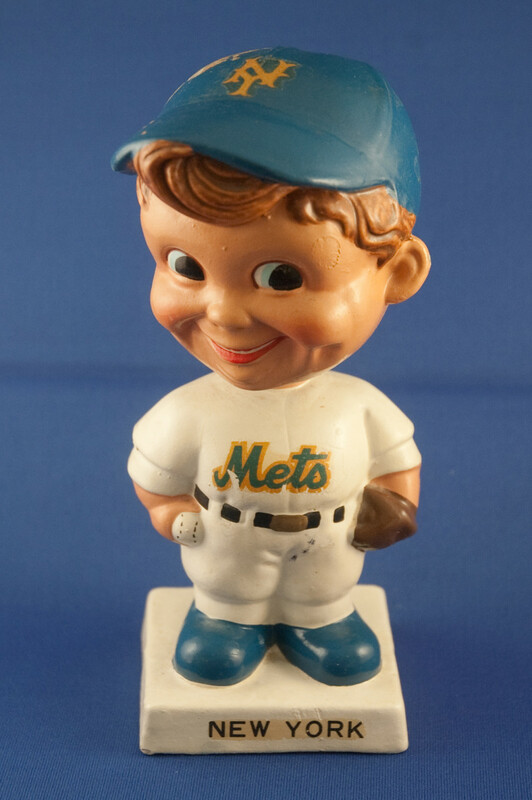 Well, as it turns out, the trade may have actually happened for a brief instant in April of 1947. During a Sox road trip to New York, Tom Yawkey, the owner of the Red Sox, and Dan Topping, the co-owner of the Yankees were having drinks at the legendary Toots Shor's saloon and began discussing Williams and DiMaggio and how they played in the wrong home parks. After more and more drinking and more and more discussion, the two owners agreed to make the trade. They decided to sleep on it and hammer out the details the next day. However, the next morning Yawkey started to have second thoughts. DiMaggio was older than Williams (32 versus 28), had slumped the previous season, and had off-season surgery to remove heel spurs. Yawkey told Topping that he would only make the deal if the Yankees threw in their young left fielder, a kid named Berra. This was too much for Topping to give up and he refused the deal. 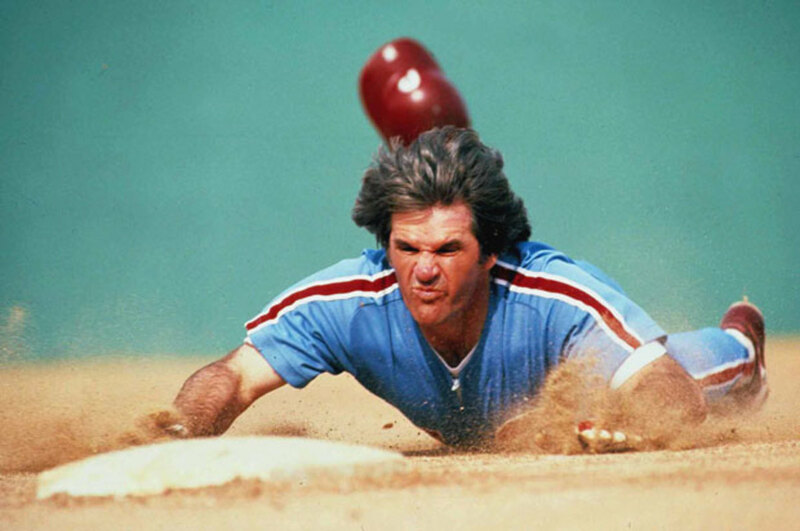 At least for one night anyway the ultimate baseball "what-if" scenario actually happened. Is Ted Williams the greatest hitter that ever lived? Ted grew up in San Diego during the depression where his mother, May Venzor Williams, was a foot soldier for the Salvation Army. May fell in love with the Salvation Army at an early age and devoted the rest of her life to the organization, often at the expense of her family. She wore her blue uniform and blue bonnet every day and was described as tireless and fearless when it came to raising money for the church. Her nickname was "Salvation May" and she sang, played instruments, and did magic tricks, anything that would help spread the good word and bring in donations. She often worked from sunrise to sunset neglecting Ted and his younger brother Danny and leaving them alone to fend for themselves. Ted's father Sam Williams was also away quite a bit. He was described as someone that would excuse himself from the dinner table and go missing for the next two or three days. Many have speculated this upbringing was the source of both Ted's formidable anger and also his enormous charitable efforts toward children with the Jimmy Fund. Ted was one of the first players to take a scientific approach to hitting, which is detailed in his fine book The Science of Hitting. He was particular persnickety about his bats, weighing them constantly, shaving down the handles, and rubbing them against an old bone to compress the wood grain. One of the more interesting stories on this subject involved a 14 year old boy named David Pressman who wrote Ted a letter in 1948 describing how he should dry his bats every day to drive off moisture that they pick up from the playing field. The boy had performed studies that showed that the moisture added 2-3 ounces of weight to the bats, which is a significant amount. He showed that drying the bats in an oven released the moisture and brought the bats back to their original weight. Ted met with the precocious boy and they had several spirited conversations about hitting theories. Ted quickly adopted the bat drying practice and used it to the end of his playing career. Pressman went on to graduate from Harvard and eventually became a cardiologist. Ted appeared on the Home Shopping Network in 1991 under the guidance of his son, John-Henry Williams, and his long time acquaintance Brian Interland. The two managed Grand Slam Enterprises, a memorabilia company that was created by John Henry and Interland to market all things Ted. It was the 50th anniversary of the magical .406 season and Grand Slam Enterprises seized the opportunity by getting Ted a spot on HSN where he hawked baseball cards, autographed balls, and other replicas. It was jarring to see the larger than life Williams on HSN. Several who saw the spot equated it to watching Hemingway hawk books or Douglas MacArthur sell corn cob pipes. It was both odd and compelling at the same time. Sports Illustrated even wrote an article about it. I searched the internet for a video clip of this spot but was unable to find anything. Many have said Ted was the smartest person they knew based on his ability to master various subjects such as hitting, fishing, aviation, and photography. He had an inquisitive mind and would pepper people he first met with penetrating questions about their line of work, interests, or hobbies and often knew more about the subjects then the person he was questioning. Red Sox announcer Curt Gowdy often said that Ted was the smartest person he had ever met. To honor his intelligence Harvard University wanted to present Ted with an honorary degree in 1991 for his unique achievements in all fields of endeavor. Always the nonconformist, Williams declined the invitation because he said he didn't earn it and that it wasn't the right thing for him. When Ted was told that Fred Astaire and Katherine Hepburn also turned down Harvard he replied he was in pretty good company. Upon his death in 2002 Ted's head and body were famously cryogenically frozen at the Alcor Life Extension facility in Scottsdale, Arizona, to preserve them for a future time when medical science could bring him back to life as a vibrant, healthy person. Williams stated in his will that he wanted to be cremated, but his son, John Henry, convinced him that cryogenics was an intriguing alternative and apparently Ted agreed as indicated by a hand written note that surfaced after his death. Much furor occurred over this incident at the time of Ted's death, but as the years have passed most have realized it was a private family matter that should never have been opened to public debate. Sadly, John Henry died shortly after Ted in 2004 due to leukemia. Due to confidentiality agreements, it hasn't been confirmed, but it is believed John Henry is also frozen at the Alcor facility next to Ted's remnants. What I find truly amazing about this whole situation is that numerous videos and pictures were taken of the procedure to remove and freeze Ted's head, but that none of them have surfaced on the internet after all these years. Hi Ted, Thanks for your feedback. How incredible it must have been to see Ted Williams play. He is a true American legend and my favorite sports hero. Thanks again for sharing. 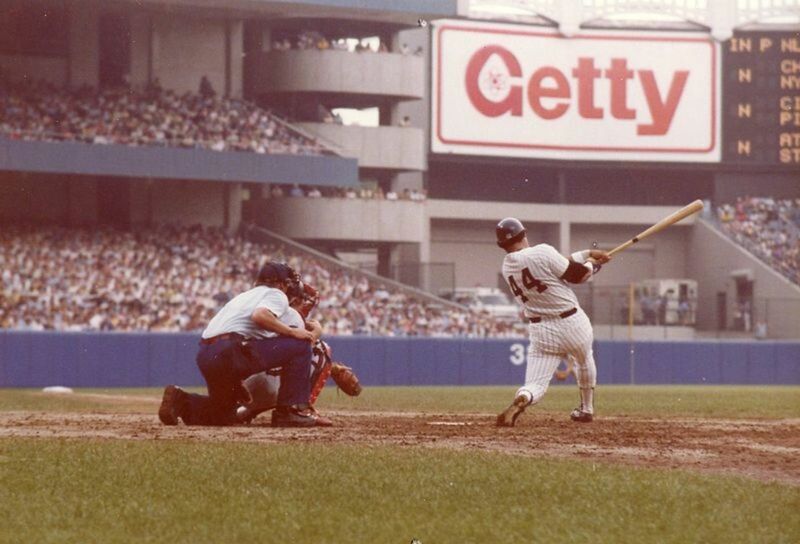 I saw Ted play in Shibe Park (Connie Mack Stadium} and in Yankee Stadium and simply adored the man. Back in the forties I don't know how I did it but I got outside the Red Sox locker room after a game in Philly and waited for Ted he opened the door and saw about twenty or thirty people waiting for him and he said "oh no" and closed the door only to return and said "everybody just stand back' and one by one he called us up and signed for us. Hi Chipp, thanks for reading. I appreciate your comments. I hope you're looking forward to spring training as much as I am. tirelesstraveler, thanks so much for reading. Glad to see you enjoyed the hub. Ted Williams certainly led a fascinating life. This is a fantastic piece. I enjoyed reading it very much. Thanks. Fascinating facts about Ted Williams. I am not even a baseball fan. It's interesting you mention Barry Bonds. I saw a side by side video comparison of his and Ted Williams' swings and they looked amazingly similar. Probably the two sweetest swings in baseball history. That divorce tidbit and the Dimaggio bit was also super interesting to me. I saw Barry Bonds play quite a few games and I often wonder if he had the short porch of Yankee stadium if he would have hit 100 HRs. It's interesting what the right park can do for your numbers! lions44, thanks for checking out the hub. Ted definitely was one of a kind, both as a player and a person. Thanks for voting up. Paul, thanks for reading and I'm glad you enjoyed it. Ted Williams truly had an amazing life. Did not know about the divorce. Very interesting stuff. He was one of a kind. Voted up. I enjoyed this. Especially the bit about drying his bats.